This is another Caltech Bookclub read, I started reading it way behind the rest of the readers, so spent much of today reading to catch up. Aaaaaaaaaand, finished it in a day. I do like reading while treadmill walking. Butler grew up in Pasadena, which is the connection to Caltech for the book club. Previous books were about Caltech scientists or Caltech research or by Techers. This one has a lot of Pasadena in it. It was neat to know where she was describing, even if the Pasadena and Altadena even I knew are as gone as hers. Butler is known as a science-fiction author. While this book has unexplained time travel as a plot mechanism, no time is spent exploring the phenomenon, making this book not really science fiction in my categorization. It is, however, a seriously good commentary on human nature. 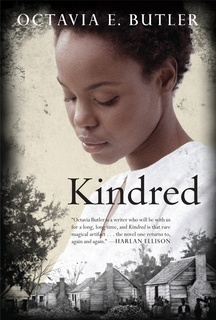 The main character, Dana, is transported back to early 1800s American South. As Dana is black, we read about the atrocities of slavery, as told from a modern person transported back to the brutality of the era. We see how we normalize horrible behaviours, often to survive. We see how we assume power, even when we are one of the powerless. We see how we don't see our own privilege, how seeing another's view is difficult, it not impossible. I think what's lingering with me most, however, is the slow descent into acceptance that Butler weaves into the story. It reminds me a great deal what Mistakes We Made (but not by me) discusses about human nature: we are all frogs in the pot about to boil. I appreciated the technological contrast between today and forty years ago in the difficulties that the characters experienced. The story told from 2018 would have been much different in the details. I suspect Dana of 2018 would not have lasted as long as Dana of 1976 did. I've read other books by Butler, on the strong recommendation from Claire and Susan. So far, all of them have been worth reading. I strongly recommend this book, and reading it for the commentary on human nature. Here's an example of where 2018 Dana could Internet Search™ for an image of freedom papers, and be able to create copies. Yet, how much would they really matter for a single black woman in the South? Tear them up and she's in the same place as she was without them. After all, how accepting would I be if I met a man who claimed to be from eighteen nineteen—or two thousand nineteen, for that matter. The timing of this cracked me up. 2019! A month away! “None of them say eighteen-anything either,” said Kevin. “But here.” He picked out a bicentennial quarter and handed it to Rufus. I so love those quarters. If you have one, send it to me! I was the worst possible guardian for him—a black to watch over him in a society that considered blacks subhuman, a woman to watch over him in a society that considered women perennial children. "Even here, not all children let themselves be molded into what their parents want them to be." White people. Privilege (such an overused, abused term these days). Explaining away the horrible actions of others as, "not that bad." Or if I had to stay here, why couldn’t I just turn these two kids away, turn off my conscience, and be a coward, safe and comfortable? When that time came, I could walk away from the agency not owing anybody. My memory of my aunt and uncle told me that even people who loved me could demand more of me than I could give—and expect their demands to be met simply because I owed them. The pain was a friend. Pain had never been a friend to me before, but now it kept me still. The fire flared up and swallowed the dry paper, and I found my thoughts shifting to Nazi book burnings. Repressive societies always seemed to understand the danger of “wrong” ideas. The discussion was about why the slaves continue to work, and why some are more motivated that others to work. “Don’t want to hear no more,” she repeated softly. “Things ain’t bad here. I can get along.” She had done the safe thing—had accepted a life of slavery because she was afraid. Ignorant as I knew I was, I trusted myself more than I trusted her. Gotten possession of the woman without having to bother with her husband. Now, somehow, Alice would have to accept not only the loss of her husband, but her own enslavement. Rufus had caused her trouble, and now he had been rewarded for it. It made no sense. No matter how kindly he treated her now that he had destroyed her, it made no sense. I went, annoyed, but silent. I thought he could have given me a decent estimate if he had wanted to. But it didn’t really matter. Kevin would receive the letter and he could come to get me. I couldn’t really doubt that Rufus had sent it. He didn’t want to lose my good will anymore than I wanted to lose his. And this was such a small thing. Wow, doesn't this feel like the Princess Bride? “Mama said she’d rather be dead than be a slave,” she said. I went out to the laundry yard to help Tess. I had come to almost welcome the hard work. It kept me from thinking. "All I want you to do is fix it so I don’t have to beat her. You’re no friend of hers if you won’t do that much!" This is totally the thinking of abusers blaming the victims, "You made me do it, you made me beat the holy hell out of you." Um... no. When she hurt, she struck out to hurt others. But she had been hurting less as the days passed, and striking out less. She went to him. She adjusted, became a quieter more subdued person. She didn’t kill, but she seemed to die a little. Would I really try again? Could I? I moved, twisted myself somehow, from my stomach onto my side. I tried to get away from my thoughts, but they still came. See how easily slaves are made? they said. But he wanted me around—someone to talk to, someone who would listen to him and care what he said, care about him. And I did. However little sense it made, I cared. I must have. I kept forgiving him for things. I wondered whether he had been able to write during the five years, or rather, whether he had been able to publish. I was sure he had been writing. I couldn’t imagine either of us going for five years without writing. Maybe he’d kept a journal or something. In other words, he was sorry. He was always sorry. He would have been amazed, uncomprehending if I refused to forgive him. I remembered suddenly the way he used to talk to his mother. If he couldn’t get what he wanted from her gently, he stopped being gentle. Why not? She always forgave him. She decided to teach me to sew. I had an old Singer at home and I could sew well enough with it to take care of my needs and Kevin’s. But I thought sewing by hand, especially sewing for “pleasure” was slow torture. Before the era of disposable clothing. He just didn’t like working alone. Actually, he didn’t like working at all. But if he had to do it, he wanted company. Sounds like a number of people I know. Sometimes I wrote things because I couldn’t say them, couldn’t sort out my feelings about them, couldn’t keep them bottled up inside me. It was a kind of writing I always destroyed afterward. It was for no one else. He lay with his head on my shoulder, his left arm around me, his right hand still holding my hand, and slowly, I realized how easy it would be for me to continue to be still and forgive him even this. So easy, in spite of all my talk. 5. “I never realized how easily people could be trained to accept slavery.” Dana says this to Kevin when they have returned to the present and are discussing their experiences in the antebellum South. Do we also in the twenty-first century still have conditioned responses to slavery?